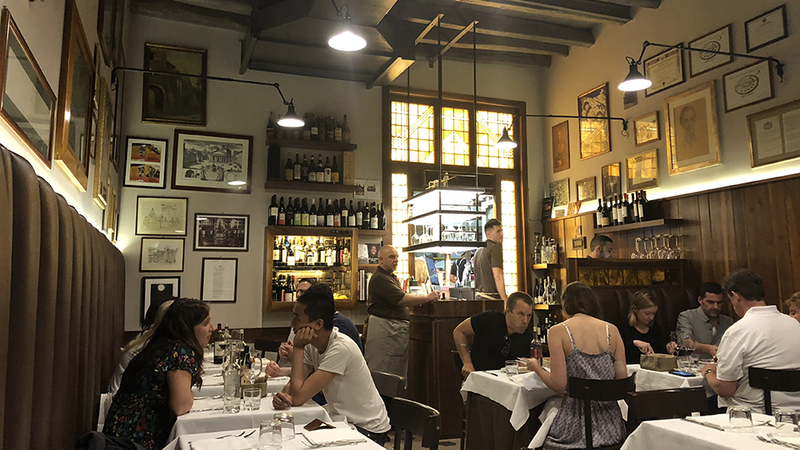 One of Rome’s best trattorias (for many experts, the best) Armando al Pantheon was established in 1961 by Armando Gargioli, but the place feels like it’s been around for far longer than that. Like a warm blanket or your favorite old sweater, Armando al Pantheon hits all the right spots with its mix of comfort food and helpful service, plus a wine list that boasts numerous very interesting choices – expertly-picked wines that aren’t just the boring list of same old names you’ll find everywhere else. Armando “retired” at the beginning of the 1990s because of health issues. His two sons Claudio and Fabrizio followed in his footsteps, with the former taking over command of the stoves and Fabrizio working the room and building the cellar. Today, Fabrizio has joined Claudio in the kitchen, while the room is cleverly managed by Fabiana (one of Claudio’s two daughters), who is also in charge of the wines, a job she enjoys and does brilliantly. But despite the unavoidable generational-induced touches, not much has really changed at Armando al Pantheon over the years. Yes, the family has also opened Casa di Armando, a bed and breakfast-type 60 square meter apartment right above the restaurant for visitors wishing to stay in the city center, run by Chiara Maria and Giulia (daughters of Claudio and Fabrizio). And sure, some items on the menu have come and gone (for example, I for one really miss the penne al gorgonzola, my single favorite Rome dish from my university days) and the restaurant’s interior has been refurbished. But all things considered, walking into Armando al Pantheon is still like taking a step back in time (and mercifully, a step out of Rome’s always frenetically busy and joyously loud city center). The menu reads like a greatest hits of Roman cuisine classics. And so, I stick with Rome’s historical dishes practically every time I dine here, though once in a while it’s good to try something different. On this night, the amuse-bouche was so very generously portioned that it made for an appetizer all by itself. 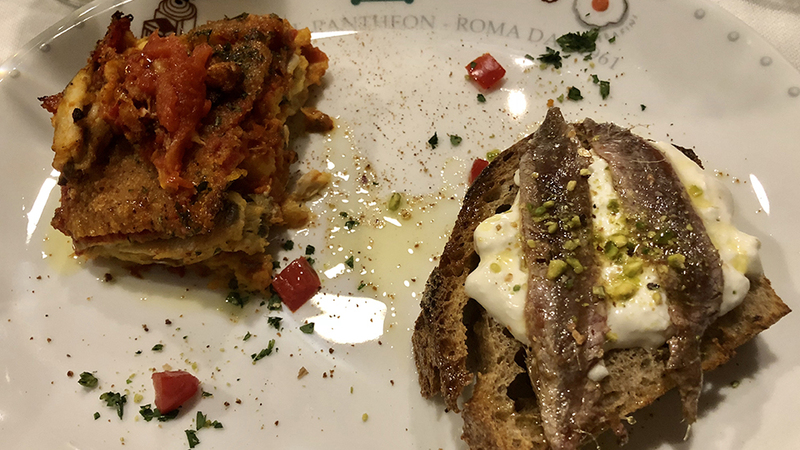 The sultry, richly creamy and decadent parmigiana di melanzane was heavenly; but the bruschetta with its thick and flavorful anchovies, their brininess buffered by the sweetness of the butter and the burrata, was even better and about as unforgettable an amuse-bouche can be. In fact, the parmigiana here is so good I decided to have a full portion too. For my money, there are few places that make a better Amatriciana pasta in Rome, and Armando’s version of rigatoni all’amatriciana rarely disappoints. 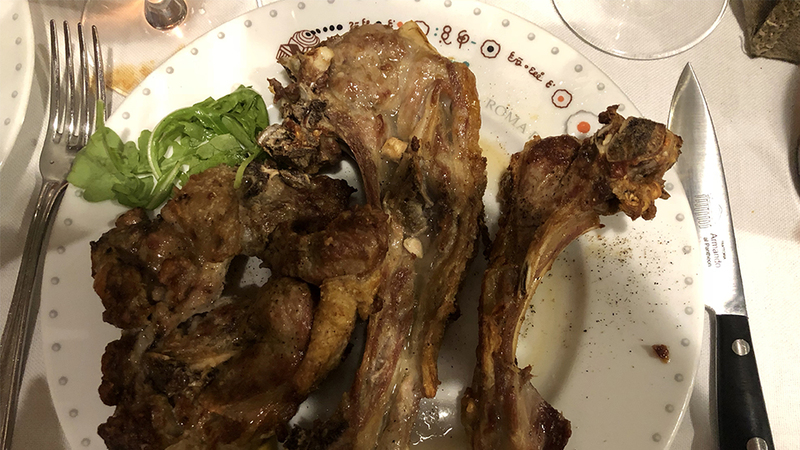 The real problem with the Gargiolis’ rendition of this heavenly Roman classic is that it always disappears so fast off the plates that you are left wondering if the dishes have invisible holes in them. Of course, it’s not at all a matter of too-small portions or leaky plates: it’s just that the tomato, pecorino and guanciale (cured pig cheek) sauce is so good, and the pasta so springy and perfectly cooked, that you just want to nail yourself down at the table and eat not stop, ordering seconds, thirds and fourths. 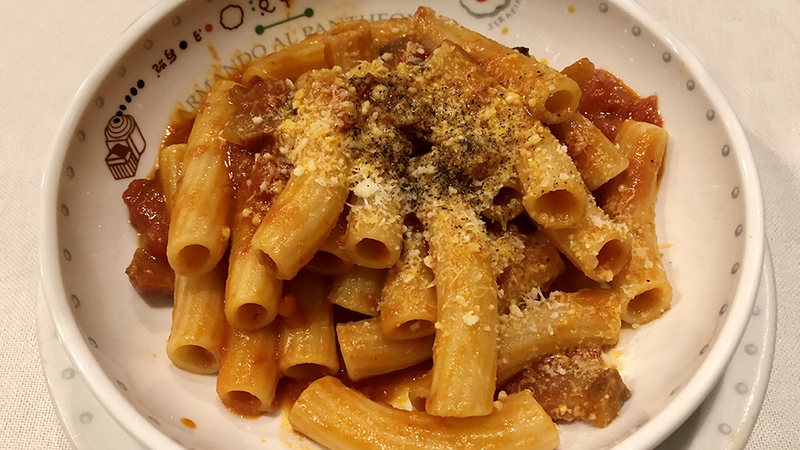 Rigatoni all’Amatriciana is a world-famous staple of Roman cuisine, though it did not actually originate in Rome, but rather in Amatrice, a town located in the mountainous north-east section of the Lazio region on the border with Abruzzo. For this reason, the correct name of the pasta is “all’amatriciana” and not “matriciana”, as you will often hear it called in Rome. The “matriciana” moniker results from the apheresis that is typical of the Roman dialect, so don’t be fooled. Tragically, Amatrice was one of the towns (along with Accumoli, Arquata del Tronto, Pescara del Tronto, and about one hour later, Norcia in Umbria) most hit by the horrible earthquake that devastated this central part of Italy on August 24, 2016, a natural disaster (6.0 on the Richter scale) the area is still trying to recover from. 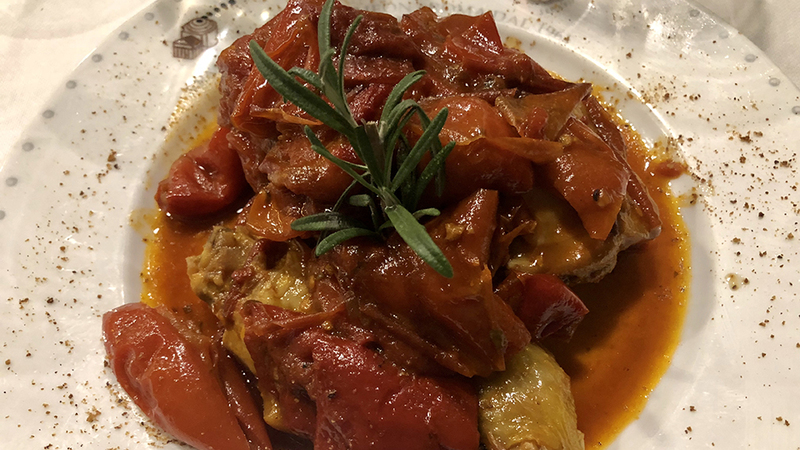 The ancestor of the amatriciana sauce is the gricia sauce, a blend of pecorino (sheep-milk cheese) and guanciale that did not include tomatoes or tomato sauce (these were most likely added in a variation to the gricia recipe after 1790; the new sauce, amatriciana, instantly popular in the 19th century, was destined to soar to even greater popularity than the gricia). Another fine Roman cuisine classic that is perfectly rendered at Armando al Pantheon is pollo ai peperoni (chicken stew with bell peppers), one in a long line of hearty, gizzard-filling preparations typical of Rome’s hearty cuisine, a dish that in fact can result heavy and oily in lesser hands, but that, at least in this restaurant, never leaves you feeling weighed down or bloated. The wine selection at Armando al Pantheon is satisfying and offers numerous bottles from outstanding producers, covering most of Italy with a few wines from each region. I especially like the fact that numerous Lazio wines are present on the list, giving wine-loving customers a chance to try something not just different but often surprisingly good (and usually inexpensive). So, if you can resist ordering beauties from Le Piane, Le Potazzine or Tiberio, go ahead and try exquisite, flavorful and accessible wines made from little-known producers that showcase Bellone, Nero di Cori, Cesanese di Affile, Moscato di Terracina, and other indigenous grape varieties that slip most people by. For instance, during my most recent dinner at Armando, I had a great time with two wines from the Lazio island of Ponza that, given their paltry production volumes, are virtually impossible to find in other Rome restaurants. The 2017 Antiche Cantine Migliaccio Fieno di Ponza Bianco is a delightfully vibrant saline and floral white wine that leaves the mouth feeling fresh and clean. Really, there are fewer less expensive and better ways to start off a meal than with this beauty. The rosé made by the same estate offers penetrating aromas and flavors of small red berries and fresh herbs. 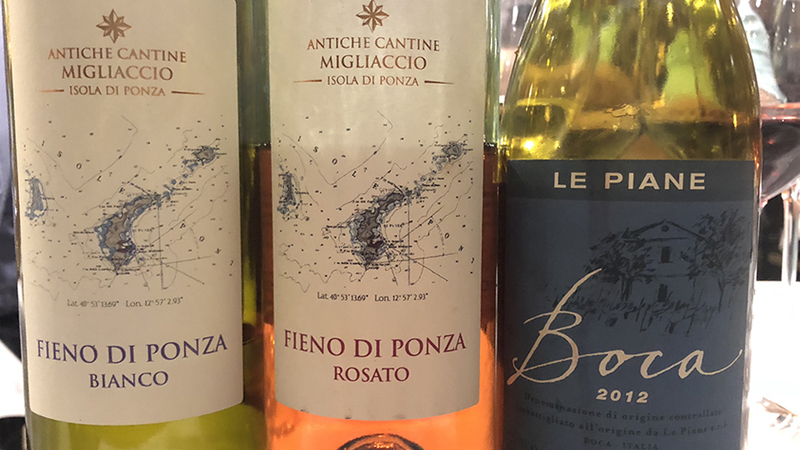 True, I don’t think the 2017 Antiche Cantine Migliaccio Fieno di Ponza Rosato will go down in history for its concentration or length, but I loved its bright salty freshness and the way it cleansed the palate after having indulged in not exactly light dishes such as the eggplant. Last but not least, I have nothing but admiration for what owner Christoph Kunzli has managed to do at his very fine Boca estate of Le Piane. The 2012 Le Piane Boca is nothing but a joy to drink. This specific vintage offers early appeal that is not typical of this wine, but also the stuffing to age well, so you might say it’s a wine that offers the best of all possible worlds. Certainly, I loved this Boca’s lush licorice, dark cherry and underbrush aromas and flavors, not to mention the refined mouthfeel it leaves behind after every swallow. I remember sitting at my table and really wanting to go with a Lazio red, but eying this beauty on the wine list just made it too tough to fend off my unquenchable thirst for Nebbiolo of all kinds. In summary, dining at Armando al Pantheon is an exercise in learning and appreciating Roman cuisine. I know only too well, as it is one of the two places I have eaten most at in my life (Cul de Sac is the other) and the restaurant doubled as one of my personal canteens back during university days. I have nothing but fond memories of the place and its people. Still today, allowing for the unavoidable occasional glitches, the food is perfectly rendered, the wines well-chosen and the ambience friendly and laid-back. Given the restaurant’s seemingly never-ending popularity, getting a reservation remains quite a chore, so plan ahead. My bet is that once you’ve had a meal here, you will want to go back, for the memories of flavorful dishes such as the amatriciana and the pollo ai peperoni are hard to forget. 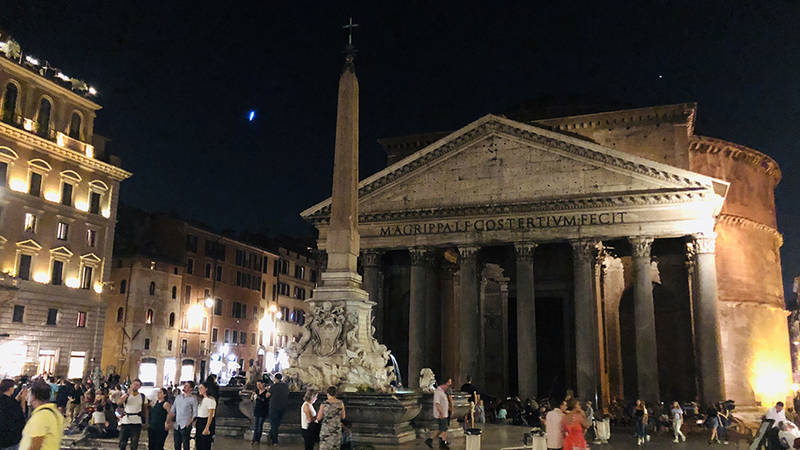 In fact, don’t mind me while I close the computer, take a quick stroll over to the Pantheon, and go catch up with Claudio, Fabiana and of course, that amatriciana.